It doesn’t seem like more than 3 years ago – but it is. On 25 February 2013, I visited St. Annes and then Lytham. The day was very cold and very dull and the results were generally in keeping with this. Having said that, the day did have its moments. I have already posted about an image of Lytham Windmill taken on that day, which I rather like (hence the post, I suppose). This post is about an unexpected subject discovered simply by exploring the vicinity of where I was and seeing what was to be found. What’s going through my mind is the opportunities that pantomimes provide for children (and parents) to shout “It’s behind you” – because that’s exactly where you come across the occasional nice surprise. It’s also about the unknown significance (at the time) of some of the things you might photograph and the sadness which might be attached to some subjects. Having photographed the windmill, I wandered round the front of the old lifeboat station and the slipway and this is where I found a couple of aged anchors. They didn’t look very happy, particularly the one standing upright – and that’s how I tried to photograph them. On 20 March 2016, I revisited the site and the anchors have subsequently been moved and renovated which, from a photographic point of view, is a shame. However, I can understand why it was done. They’ve been cleaned up and painted and moved to the top of the slipway. They’ve also been separated and no longer provide the same photographic opportunity as I had been presented with in 2013. However, there is now a plaque providing a history of the two anchors and what a sad history it is! 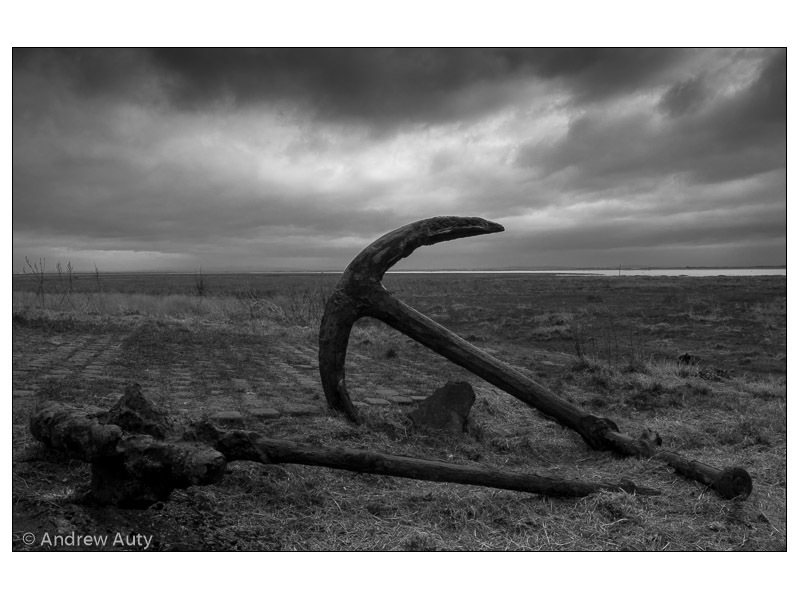 The larger anchor with the metal cross-piece is of the type lost by the “Mexico” during the disaster on 9 December 1886 off Birkdale which claimed the lives of all the crew of the St. Annes lifeboat (Laura Janet) and all but two of the crew of the Southport lifeboat (Eliza Fernley). The disaster is the worst in the history of the Royal National Lifeboat Institution and for anyone interested, more details can be found here or by searching the internet. This entry was posted in Miscellaneous and tagged Eliza Fernley, Laura Janet, Lifeboat Disaster 1886, Lytham on 4th April 2016 by Andrew.